Contest: Win a FREE $25 Amazon Gift Card - Download COMISH Today! 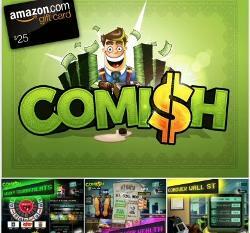 Win a FREE $25 Amazon Gift Card - Download COMISH Today! Prize: Download Comish, the hilarious new Stock Broker Simulator game, for a chance to win a [b]$25 Amazon Gift Card[/b]. Spend it on anything you want... like dog pajamas or maybe even a down payment on a shiny, jumpy, new pogo stick! Statistics: This contest was opened by 107 and entered by 3 ContestChest.com members. 3% of those who opened the contest, entered it.